A fortnight ago we ran a poll asking for details of your favourite setup’s locations and lures to target Bream on Surface (check out the full details by clicking the “view results” link for each question, and if you haven’t voted yet, make sure you do so). The results were pretty interesting, but not entirely surprising. So what did we learn? 56% of you prefer a 7’ rod for the application, 44 % want that fishing rod to have a fast action, to accommodate the braid running a leader less than 3 meters. That leader is in the 4lb line class, and is tied in 25% of cases to either a “large walk the dog”. “Bent Minnow” or “small walk the dog” style lure. Not surprisingly either, most (almost 50%) of you noted weed flats as your favourite structure for this style of fishing – though I personally prefer tight structure like jettys, docks and pontoons, especially if they have great subsurface structure like broken rock and weed. Now we know what gear to use, and generally what structure to target, here are 4 tips that may help those starting out with this style of fishing to catch more fish? Stealth & finesse: though not a hard and fast rule, most of my surface fishing is usually done early in the morning, when it’s quiet and often quite still. As with all fishing applications, stealth is an important consideration. Pulling into a quiet bay, or onto a quiet weed flat and making a ruckus that would wake the dead is a sure-fire way to spook all of the fish in the area. 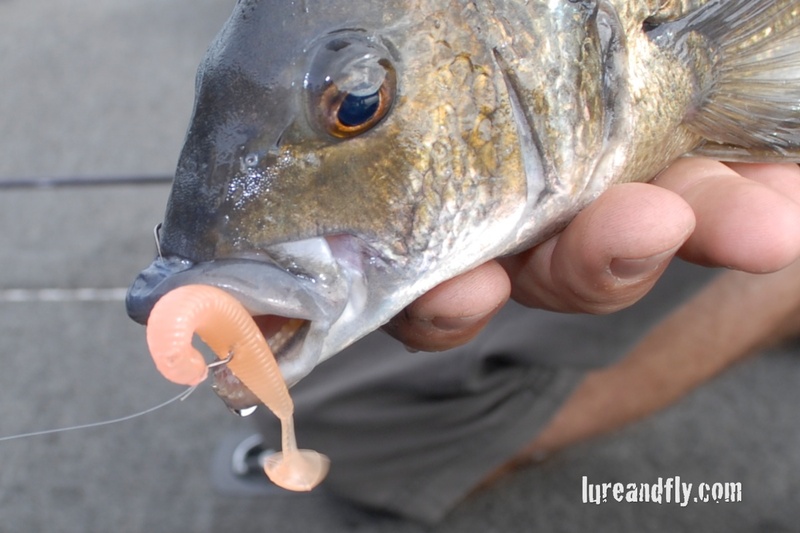 The size of the lure and the aggressiveness of your retrieve are important considerations also. Start small and fish with finesse to start. Slow down and pause your lure – sometimes even to the point of over exaggeration. Casting accuracy/and distance: The distance bit goes with the stealth. If you can make long searching casts without scaring every fish in the vicinity, you’re likely to raise more fish. The accuracy part is important to make sure you’re placing your lure in the strike zone, or as close to it as possible. No point making the long stealth cast, if you’re landing the lure miles from the fish. Casting accuracy and distance are aspects of your fishing that you need to practice. The more you practice, the better you’ll get, but if you don’t give it a crack and fail a couple of times, you’ll never improve. Look for current: I fish strong tidal areas as a general rule, and all of my fishing is dependent and closely linked to tidal influence. For me it doesn’t matter if I’m fishing man made structure or natural, I prefer to fish areas that are in the current, or adjacent to it. The structure creates breaks in the current where the fish lurk, and food and bait drifting past creates a reaction not too dissimilar to a 5 year old at a birthday party watching the hostess walking past with a bowl of lollies… Sometimes it’s like they’ve never seen food before! Wind is your friend: On the occasions that I don’t fish early in the morning, my most productive sessions have been when there’s a bit of ripple on the water that helps mask the presence of the boat, and provides the fish with a bit of confidence. Pulling out the bigger lures seems to work in these situations, and even the most aggressive retrieves can entice a boil, sometimes centimetres from the boat. Remember to take a moment to assess the situation before you start. Think about how you will approach the structure, what direction in relation to the tide and wind, and most importantly, stay tuned to what the fish are telling you that they want, and adjust your techniques accordingly. I certainly agree with the importance of stealth. I do most my surface lure fishing over the flats in shallow water because the fish that are there tend to be feeding which makes them willing surface lure targets. If you don’t spook them the fishing can be very productive. 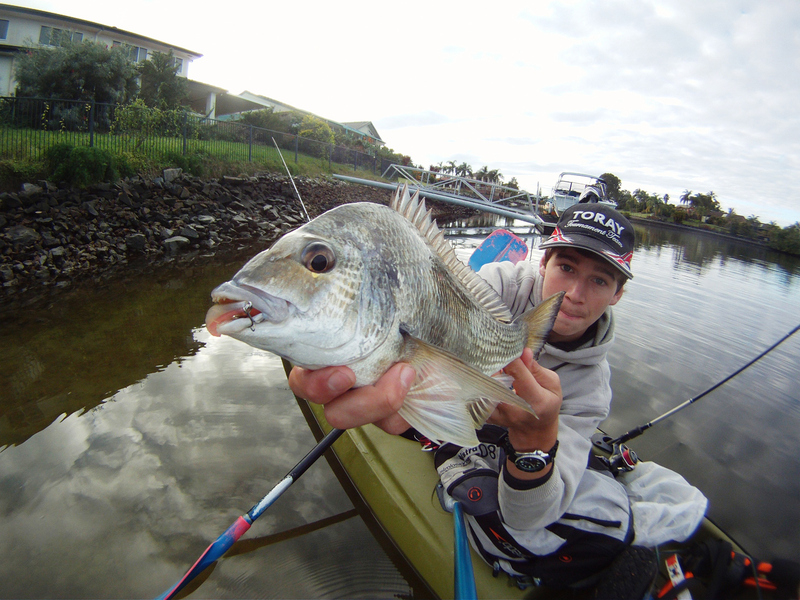 That’s why I use a kayak – I can get close without the fish knowing I’m there.